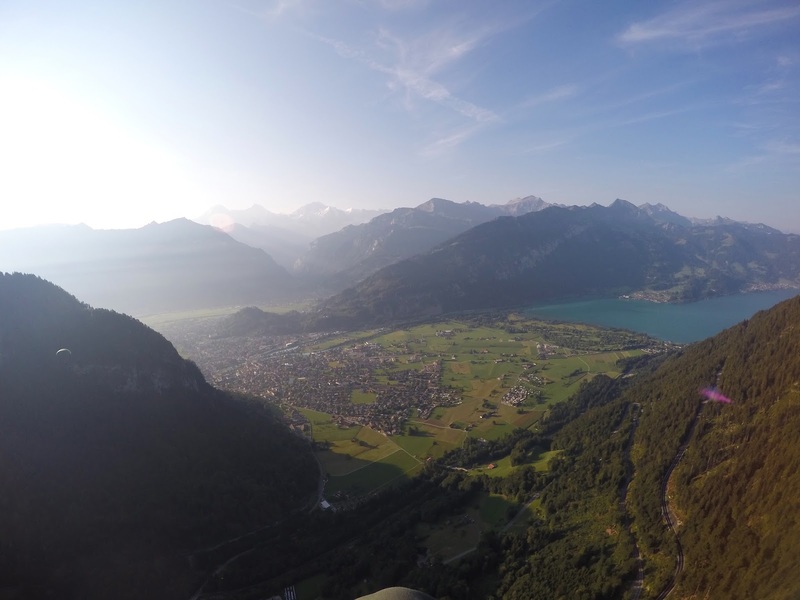 Interlaken…it gets it’s name from well, being literally surrounded by lakes and water! Lake Breinz and Lake Thun which sit either side of the town are not only some of the most stunning in Switzerland but in the entire world. No wonder they named the town in acknowledgement of these lakes! Here’s a guide to these most picturesque of lakes. Lake Thun and lake Breinz are the two main lakes of Interlaken which sits on the “bodeli” or tongue of land which separates them both from one another. The Villages of Thun and Brienz are where they takes their names from, both are roughly at the opposite ends of the lakes from Interlaken. Breinz, which is the smaller of the two by quite small margins, is fed by the river Aare and also the Lutschine…which we rafted down in to the river! The river Aare runs through the town of interlaken, carrying with it that signature turquoise water, and scores into Lake Thun. Before the last glacial period both lakes were joined together in what was known as “Lake Wendel”. After the 10th century a split occurred and the “Bodeli” was formed. The Bodeli is the area of land the towns of Unterseen, Interlaken and Matten now sit on in a closed settlement surrounded by lakes and mountain. This piece of land was created over millennia by debris cascading down the mountainside from the rivers Lutschine and Lombach! Nature always astounds me! One of the best and most relaxing ways to experience the lakes is by taking one of the many boat services which cross the waters. Ships have been operating across these lakes since 1839 and offer a range of trips. From taking the boat as a means of transport to visit the lovely towns of Brienz, Thun or several other small villages or as a pleasure cruise to take in the scenic surroundings. On Brienz a popular trip is to the Giessbach Falls via a funicular the ships connect to. For something a little more exciting Kayaks, Canoes and Stand up paddleboards can be rented out to explore the lake from a more personal perspective. This way you can really see the lakes up close and in all their amazing detail. Rental prices are quite cheap and offer an awesome budget activity! But if you want something really unique how about surfing on the lakes?! We often said the only thing Interlaken is missing is a beach, but that doesn’t mean you can’t surf? Wake surfing, boarding and skilling are all available for some extreme sports action too! Not only that but tubbing, banana rides and jet boats are all part of the endless fun and excitement that can be had on the lakes. 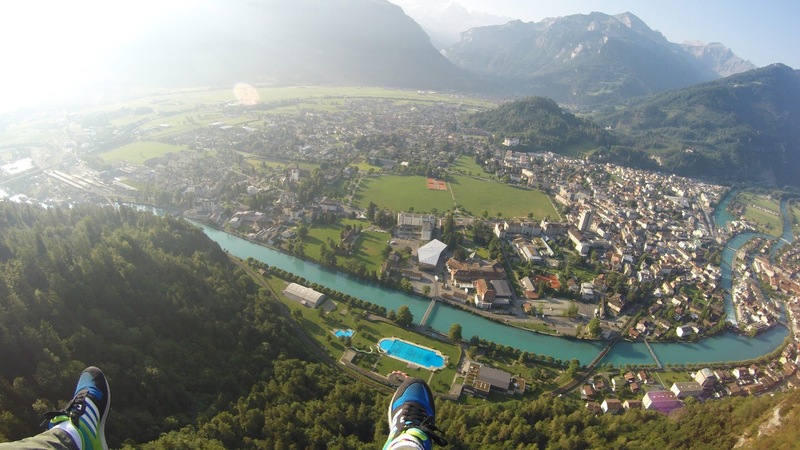 Just like with the rest of Interlaken… if it exists you can do it here! Of course, these is a way to have fun on the lake for almost nothing…go swimming! Both lakes are perfect for a swim and in the summer are a pleasant temperature. Around the edges of the lakes there are several platforms from which to decend into the water and ones moored within the water for safety if you want more of a wild swimming experience. 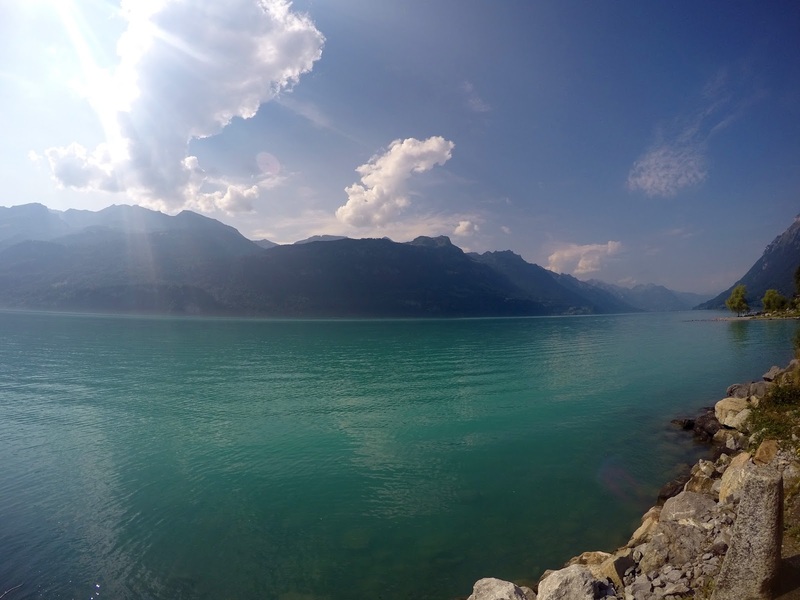 Lake brienz is surrounded by several lidos making for safe access to the turquoise mountain waters. Here you can find sun decks, changing rooms, floats and often life guards. Some have wonderful little beaches as well as separate heated pools too for when the lake is a little chilly! We swam in the lake after our White Water rafting trip which dropped us straight from the icy river to the warm waters of brienz. My skin had never felt so smooth and healthy after being in water so clean and pure! One of the best ways to see the lakes is using the power of your own two feet! Whether that be a gentle stroll close to town or a ride around the whole lake it’s always a great way to take in the beauty of these lakes. Thun for examples has several trails consisting of downhill mountain biking tracks to gentle rides. 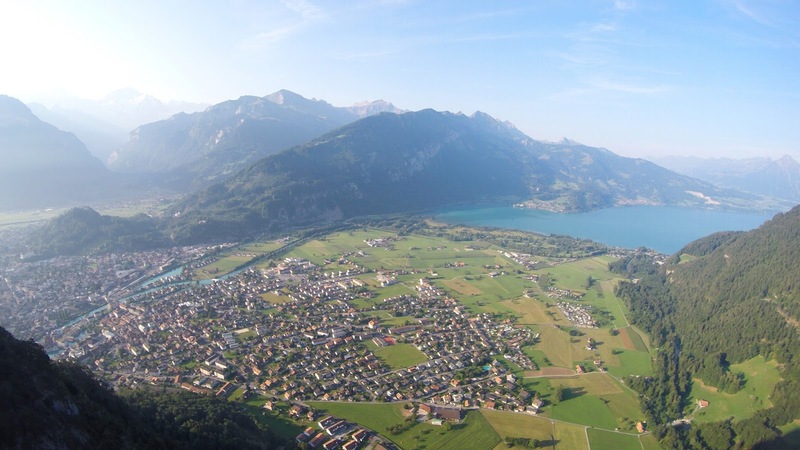 Similarly you could head to Thun or Brienz and take a leisurely stroll alongside the lakeside and even stop for a quite paddle, or you could hike all the way up Interlaken’s house mountain, Harder Kulm and see these impressive lakes from above! Bikes are available to hire from several places in Interlaken and prices are usually budget friendly. Not only does Interlaken have two amazing lakes to boast about but the rivers which feed them and run through the town are just as impressive. If it is quaint beauty you are after you can follow the River Aare right through the middle of town from one lake to the other. Tracing it’s deep blue waters as it meanders gently through the town, flanked by flowers, traditional houses and with views of Jungfrau a wander down by the Aare is Alpine paradise! For something a little more exciting there is the glacial melt waters of the Lutschine. The icy grey shades of the water match it’s freezing temperatures as it feeds directly off the Eiger, Monch and Jungfrau. The roaring rapids and white water can be an intimidating and powerful sight, but for the thrill seeker a perfect spot for some White Water Rafting!! So there you go, there is much more to Interlaken’s glistening blue lakes than meets the eye! But hey, they do look stunning don’t they! What’s the most beautiful lake you have ever visited? 39 Stunning Photos which will make you want to pack up and head for SWITZERLAND!! The best Adventure Activities to do whilst travelling! Looks beautiful! Never thought about visiting Switzerland before, but it may be on my list now! yes, it is such a stunning country, it will blow your mind!! These lakes are absolutely stunning!! And I love the expressions on your faces – they really show how cold the water is! Haha! Beautiful place! It looks cold though even from the photos 😀 Good to know that there are several activities you can do while in Interlaken! No it was really warm, in the 30s (c) when we visited, in summer Switzerland gets awesome weather and lots to do too when its hot!